Contrary to popular belief, Shoreditch is not just full of hipsters and over-priced cafes and bars. Although it has in the last twenty years or so gone through gentrification, it’s very multicultural and full of history. We got the Metropolitan line to Liverpool street and started our afternoon with lunch at Canto Corvino, newly opened in Spitalfields. 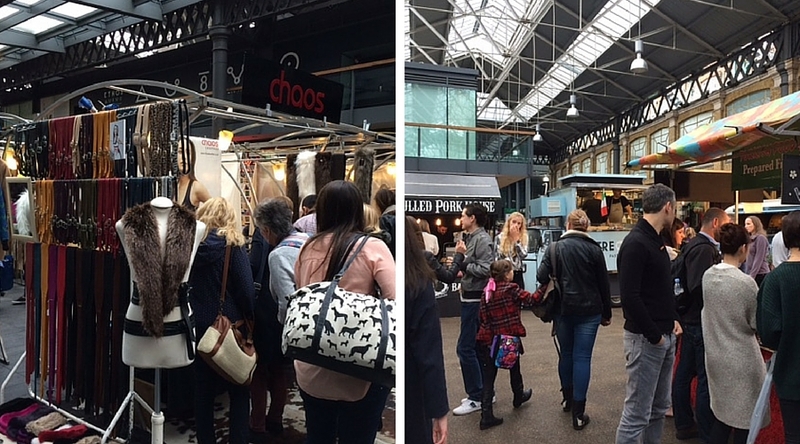 After lunch, we headed to Old Spitalfields Market to browse the stalls. Apparently there has been a market on the site for over 350 years and in 1991 it became known as Old Spitalfields Market. The market is open seven days a week and consists of shops, restaurants and stalls selling everything from art and jewellery to clothes and street food. The market is housed in Grade II listed buildings, built between 1885 and 1893 but is flanked by modern buildings, such as Bishops Square which was designed by renowned architect Norman Foster. On the weekend, the market is always buzzing. This weekend the market was hosting London Cocktail Week so there were lots of really cool, funky stalls and vans selling cocktails. As we’d already had two glasses of wine with lunch, we decided to abstain from any cocktails (even though they were very tempting!). The market regularly hosts events, such as the Record Fair and the Designers/Makers market as well as lots of vintage markets. Check out their website to see which events they have coming up. What I love about this market is that most of the stalls are independent and unique – there isn’t stall after stall selling the exact same thing. I couldn’t resist treating myself to something so I bought this gorgeous handmade, leather wallet/travel card holder from Nat Boyd for just £10. If you’re interested in Jack the Ripper, head across the road from the market to have a drink in the historic The Ten Bells pub. Although the name has changed, this pub is associated with two of Jack the Ripper’s victims, Annie Chapman and Mary Kelly and always forms part of a Jack the Ripper walking tour. After the market we headed to Brick Lane, which is famous for its curry houses and is home to London’s Bangladeshi community. It also has lots of little markets dotted along the road and the Old Truman Brewery, which now houses offices, independent shops, galleries, markets, bars and restaurants, takes centre stage. For independent, up-and-coming designers take a look at The Laden Showroom or, if it’s vintage that you’re looking for, Rockit is right next door. In fact here’s a whole list of boutiques on Brick Lane, for all you fashion lovers. If you have time for afternoon tea, head to The Vintage Emporium on Bacon street where you can have tea and cake inside a vintage clothing shop. 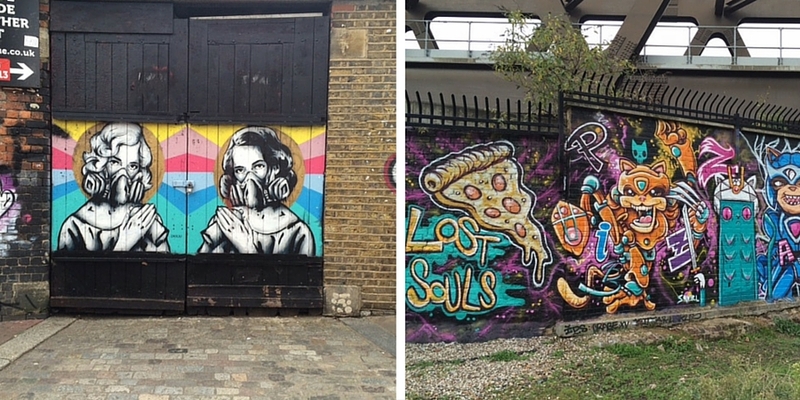 Keep an eye out for the amazing street art that can be found all over Shoreditch. In fact Shoreditch is full of art galleries including the Red Gallery, which runs an arts club, hosts exhibitions, film screenings, talks and lectures as well as running live comedy and music nights. Whilst walking back towards Liverpool Street station, we were lucky to see a street artist in action. I’m really keen in joining a street art walking tour next to learn more about these artists and their work. 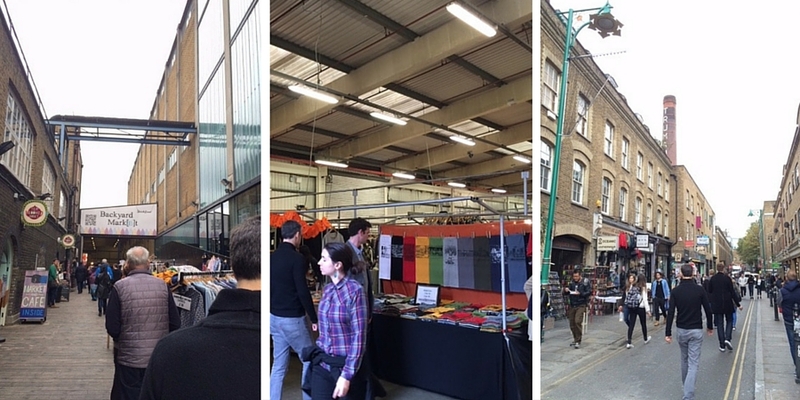 If you enjoyed Exploring Shoreditch, why not read my post on Exploring Bermondsey. We had a flying visit to Shoreditch last weekend (Bloom Perfumery). Would definitely like to go back and explore more. I’ve not been to Bloom Perfumery but it looks lovely. Will definitely pay it a visit. Shoreditch is a great place to explore! Love Spitalfields and Brick Lane. Enjoined seeing the street art memorial to Terry Prachett last time I was there. Yes, we saw it too but there were lots of people standing around so I didn’t get a chance to take any photos! Next time, hopefully! Oh yes, a whole day is definitely needed Elizabeth! Wish I’d known about the cocktails in advance so I could’ve saved myself at lunch! I think I might go to Shoreditch for my next photoshoot I love the street art that you showcased in your photos. How far is it from Central London? I first went around 1998/2000 and I agree with you Jade, it was nowhere near as nice as it is now (in terms of design and layout). It really is one of London’s best markets – although I also like Portobello Road too! I stopped off in Shoreditch last weekend and couldn’t believe how busy it was but it was really nice! I realised whilst there that I’ve never been to any of the big London markets – shocking!